It is perhaps the health issue of our time, with around 26 per cent of adults in England classed as obese; however, approaches to prevention are often over-simplified and the condition itself so stigmatised people feel reluctant to seek support. 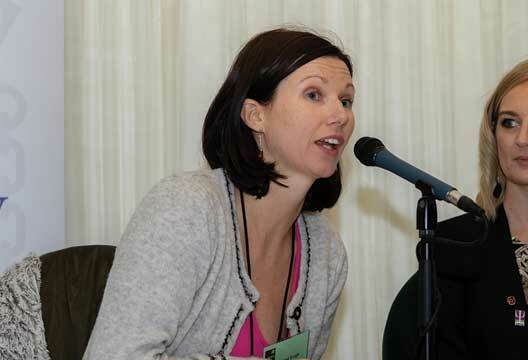 The sixth meeting of the All Party Parliamentary Group (APPG) on psychology brought together a panel of experts at the Houses of Parliament to raise awareness among policy makers of the psychological drivers of obesity and how to approach prevention. On the same day the British Psychological Society (BPS) published a briefing paper on the issue calling for better psychological support for people struggling with their weight and outlining the complex social, environmental, psychological and biological causes of obesity. The authors also called for better framing of health campaigns, specifically avoiding the framing of obesity as a simple choice, weight loss services that serve everyone at an unhealthy weight, including those whose BMI is over 50, and incentives to conduct further research into tackling the stigma that prevents people accessing weight loss services. After an introduction by APPG Chair and former clinical psychologist and SNP MP Lisa Cameron, Dr Sinead Singh (pictured above) shared the story of ‘Emma’ as a way to represent the true complexity of obesity. As a child, Emma built an association between food and comfort and slowly gained weight, exacerbated by personal and family trauma. As an adult, an injury at work left her unemployed and turning to food for comfort and experiencing daily stigmatising messages in the media toward obese people. When she turned to her GP, she felt judged and criticised and following bariatric surgery received no psychological support, leading to further weight gain and eventually diabetes and hospitalisation. Singh said it is plain to see that the causes and drivers of obesity are not straightforward, and treating the problem as simplistic and placing blame on an individual further stigmatises them and the condition. Those designing public health campaigns should be aware of the language and images they use, and Singh recommended that research into this area be better incentivised and that public health campaigns should use psychological evidence. Health psychologist Dr Angel Chater explained the biopsychosocial model the BPS briefing paper was based on. She also outlined the usefulness of psychological expertise within public health concerns – psychologists can help understand the drivers of behaviour, how to change that behaviour and how to break the cyclical effect of low mood and guilt on motivation to change.She explained that three factors need to be considered with a target population for behaviour change: whether they have the capability, opportunity and motivation to enact a behaviour. Health psychologist Dr Fiona Gillison (University of Bath) gave examples of why some policies are taken up by the public willingly while others backfire. She gave the example of Jamie Oliver’s campaign to improve school meals, and the parents who subsequently turned up at schools with take-aways for their children. In this case parents felt as if their choice had been taken away and that their children would be hungry and reacted accordingly. Psychology can help us understand how to avoid this kind of reaction, how to tap into people’s intrinsic motivation and how to keep motivation going over a prolonged period. Criticisms of the National Child Measurement Programme have suggested measuring children could trigger eating disorders or cause certain children to be bullied, we can learn valuable lessons from parents’ concerns that they are more worried about their child’s wellbeing in the here and now than whether they will develop diabetes in 50 years. Children are, of course, a key concern with one in four children in reception being overweight and one in three by year six. However, Gillison emphasised that we should listen to parents about what types of intervention are acceptable to them. Finally, Consultant Clinical Psychologist Dr Helen Moffat (NHS Grampian) gave an overview of the support available in the NHS to people with obesity. Tier three services serve people with a BMI over 40, while these services are meant to include psychologists, many don’t, and people may be offered therapy, medication and possibly low-calorie meal replacement plans. People should spend at least six months in tier three before being referred to bariatric surgery in tier four. Psychological support and understanding when helping people with obesity is key, said Moffat, with many suffering with mental health problems and trauma. There are disproportionate levels of depression and anxiety in those who are obese, and people with learning disabilities and mental illness show levels of obesity two to three times higher than the general population. Up to half of people attending obesity services will have experienced childhood adversity and many have experienced trauma as an adult. Moffat said that services should include behavioural interventions and that prior to surgery behavioural approaches and a psychological assessment should be offered; however, she acknowledged, coverage is often patchy. She suggested that NICE guidelines could be developed to include clear recommendations for incorporating psychology into services, funding for services to be as strong as they can be and investment into research.